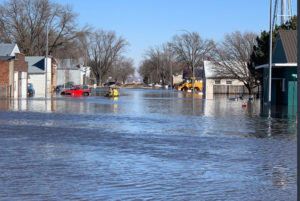 Power was restored in the western Iowa city of Hornick Monday and residents could return to their flooded town. Mayor Scott Mitchell says he’s worried some residents won’t want to stay and the town will lose people. “In turn, you can’t really blame them, but I hate to see it. This is a small community, we’re all a little family and we all kind of stick together. Anybody we would lose or could lose, it’s a big hit to every one of us,” Mitchell says. People in the city have been asked to avoid using their toilets, sinks and showers as officials work to get the city’s sewer system back to 100-percent functional. Mitchell says people have already started cleaning up their properties. “They’re tearing out carpet and we have groups of volunteers in to help deal with the cleanup effort and start the process of rebuilding and trying to get back to a normal life,” he says. Mitchell says his own basement had about five feet of water when he first got back in Monday. Flooding took out his furnace, washer and dryer. Governor Kim Reynolds visited Hornick on Sunday to see the damage.